Composite images — examples of combining product views into a single image that is automatically placed with the corresponding description, bullets, and variants. Emphasis on variant detail — More detail about variants inspires greater confidence in your products. Variant images and icons — The more you can illustrate about differences between variants, the better. Auto layout switching — Rather than forcing all products to the same width on the page, use smart automation to arrange the products for best fit. The eBook covers these topics and more. Each one is shown with an example from a catalog. 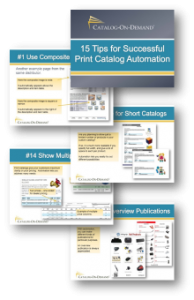 We hope this will help you plan your upcoming print catalog automation project. Let us know if we can help in any way!